The 1 TIX Commander Challenge returns! This time, it’s my swing-n-fling Zurgo Bellstriker versus Corey Murphy’s (Card Knock Life) mono-green ramp Sasaya, Orochi Ascendant. As mentioned previously in my Daxos of Meletis budget commander deck tech, I firmly believe that the secret to brewing on the cheap is to really focus in on a singular strategy. In this week’s build, I’m going for aggressive yet controlling. Not only does this deck beat face reliably, but it actually comes in under our single ticket budget by about 10%! I would even go so far as to call this build hyper-budget, currently priced at just under $23.00 in paper, leaving plenty of room for potential upgrades. Scroll down for my full list and deck tech below (or watch the embedded video deck tech on YouTube). 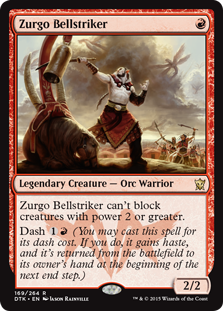 Zurgo Bellstriker may be our commander, but to be honest, we could be using just about any other mono-red Legend in his place. We do not need Zurgo in play to win the game, but he does provide a reliable Turn 1 play that will almost always get some damage through in the early game. Later, we’ll use him as fodder for our primary strategy. That primary strategy, as I called it above, is to swing-n-fling our way to victory. This deck gets in with attacks as soon as possible, and then we’ll throw the creatures we control at the opponent to sneak in a bit more damage. You may notice that this deck runs a small number of creatures, but those that we play hit hard. And—with few exceptions—they do so the turn they hit the battlefield, one way or the other. 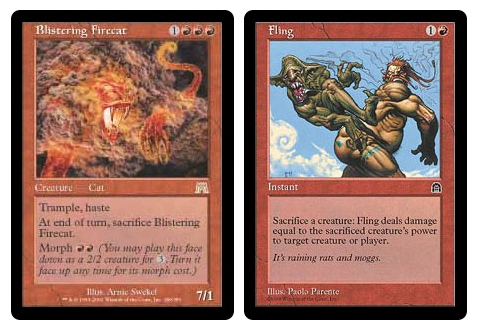 Blistering Firecat can swing in as a 7/1 with Trample and Haste for only 1RRR, trading with just about anything that attempts to stop it. Or it could sneak in unblocked for the full seven when morphed. 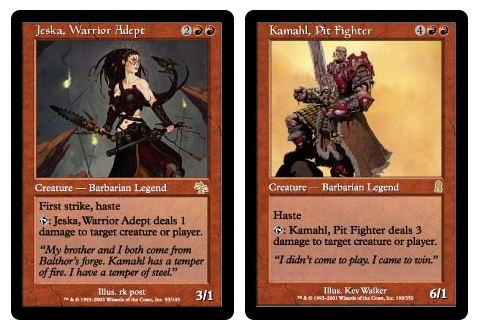 Jeska, Warrior Adept and Kamahl, Pit Fighter give us options to lay on the pain when the coast is clear, or sit back to ping our opponent to death (don’t forget the added bonus of making combat and casting creatures much more difficult). 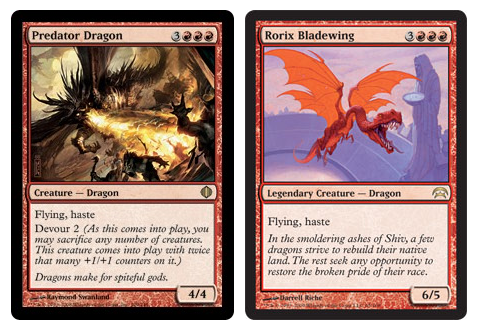 Topping out the curve are some powerful Haste-y creatures, like Predator Dragon and Rorix Bladewing. Along the way, we’ll be dropping other aggressive beaters, like Rakka Mar, Falkenrath Marauders and Charging Monstrosaur. These creatures are suited to pumping as much of our mana as possible into combat damage each and every turn. A good portion of the deck is dedicated to ways we can throw creatures at our opponent or their creatures, or otherwise make use of them in a sacrificial manner. Some of our creatures are not long for this world. Blistering Firecat, Hell’s Thunder and Keldon Champion are all under-costed sources of damage just begging to be flung. Come with me to Magical Christmasland, where Fling and the Firecat lets us hit our opponent for up to 14 damage on Turn 4. This deck runs a bevy of other sacrifice outlets, like Scorched Rusalka, Barrage of Expendables and Blood Rites. There are also spells that trade creatures for targeted damage or other benefits, like Collateral Damage and Infernal Plunge. 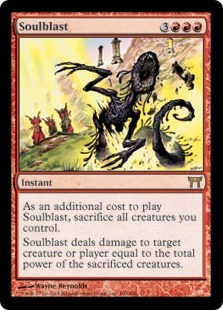 For the ultimate in sacrifice, we have one of my favorite cards in the deck: Soulblast. For six mana, we can fling our entire board at the opponent’s face in one fell swoop. We actually care far less about flinging or sacrificing our own creatures than we do our opponent’s. A large chunk of our deck is full of these effects that steal an opponent’s creatures, and you may begin to see the control aspect mentioned at the beginning of this piece. Effects like Act of Treason or Wrangle are generally not considered particularly powerful. Stealing a creature temporarily is not often going to win you the game. But when that creature is not likely to return, these spells become removal as well. As such, one of our absolute best cards in the deck is Spawning Pit, which will always allow us to sacrifice a stolen creature without needing extra mana. In a 1-on-1 situation, it’s not unreasonable that a good draw leaves the opponent with a nearly empty board at all times. In addition to the slew of capture spells, our creatures are looking to get in on the action. Cards like Jeering Instigator, Zealous Conscripts and others take a creature now, leaving an additional body behind to fight the next turn. New from Ixalan, Captivating Crew will even offer the effect on repeat. While the name of the game with this Zurgo build is to steal, swing and sacrifice, I think it’s important to comment on my efforts to provide some sort of card advantage. 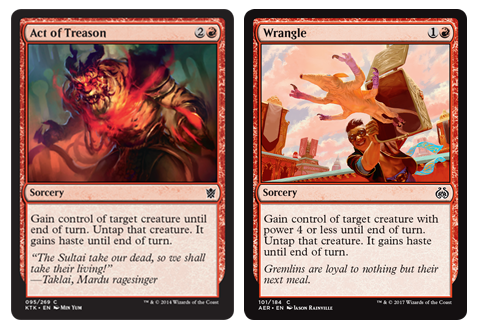 Red is a color that is notoriously bad at drawing cards, which often means mono-red commanders just do not work out well (or are easily taken out of the game by a well-timed board wipe). There are two kinds of card advantage in this deck. The first form is a kind of “virtual” card advantage, in that many of the creature spells an opponent casts will be stolen and used by us. Your opponent spends one card casting a creature. We spend one card to attack with that creature for a turn, remove that creature from the battlefield and hopefully gain an incremental advantage when we do. In these cases, creatures that do not affect the board immediately are a complete loss for our adversary. The second form of card advantage is literal. There are just going to be those unavoidable draws where we have too many lands, or dead cards in hand. Unfortunately, red doesn’t get to draw cards without paying some price first. With that in mind, we’re running more or less every effect like Tormenting Voice and Cathartic Reunion we can afford. That also includes spells like Faithless Looting, Magmatic Insight and the like. Since our deck ran so far under budget, I also decided to play both Desert of the Fervent and Forgotten Cave, which we hope to cycle more often than not. Additionally, the budget allowed for two of our most expensive cards, Pyretic Ritual and Seething Song, in hopes that we may land one of our curve toppers earlier than expected. 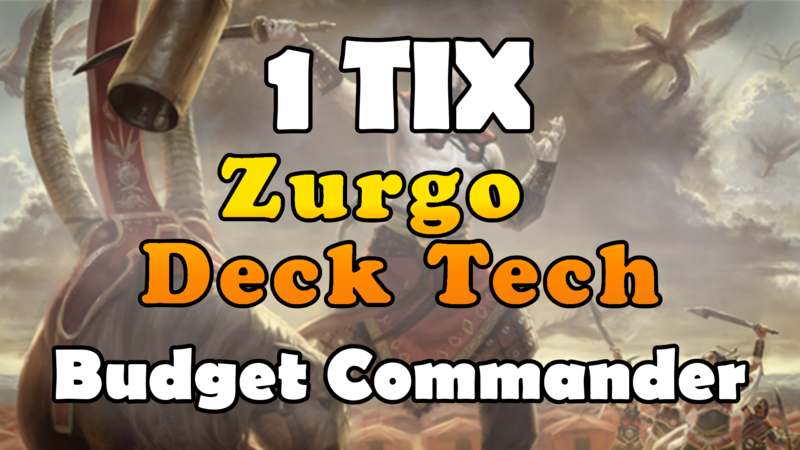 That’s our budget Zurgo Bellstriker EDH build for the 1 TIX Commander Challenge! If you decide to give this a shot, there is a huge amount of room for customization and upgrades. It’s an exceptionally aggressive deck in a 2-player Commander environment, and I hope you have fun seeing just how oppressive it can be. Check out the full episode where Zurgo faces off against Sasaya, Orochi Ascendant below, and subscribe on YouTube for more budget commander brews!